Hasn’t every reader wondered how we built Teribithia since I posted Part One? Well, in this post we will go through how we built Teribithia, so you can too! 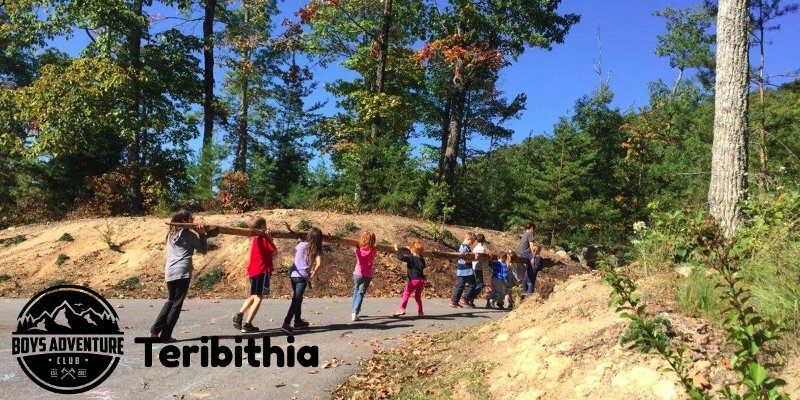 The number one thing we learned in Teribithia is teamwork. If we hadn’t been able to work together as a team you probably would have never read this post. Teamwork is important no matter what type of village you build. The other important thing we had was a leader. The leader doesn’t necessarily have to be the oldest, rather that the person is good at keeping everything working smoothly. The Palace- The Teribithia Tennessee palace was probably the second biggest Teribithian building. We found a big tree and started placing logs around it, to create the frame of a large hut. After the frame was done, we put smaller sticks and leaves on to create a huge palace. It was awesome!!!!! tree. We found some nails that worked perfect for what we wanted to do. We used a rock to hammer them in. The picture on the right is the church. The Great Moss Road- The great moss road was fairly simple. We collected near by moss and laid it down in the spot we had picked. We also sprinkled some water on, to help the roots. The Houses- We found a tall tree that we decided would work. We found some fat branches and put them around the tree to make a frame about half the size of the Palace. The final thing we did was lay down some bandannas for the floor. The Banana House- The banana house was one of the buildings that took a few days. We found a place that had some evergreen branches hanging over each other and decided to start building a there. We gathered thatch (see Part 2) and used that to make a wall. We had found this thick steal pipe that we used as a chair. We also found this old motor, that worked really well for a mini fan. The Shelter- So, a few days before we built Teribithia in Canada me and Abbie and her Brother, Caden built this really cool shelter. The goal was to do a little pre Teribithia survival practice. Like the Banana House, it was built under a few evergreen trees. Under the evergreen trees we built a little lean to (see survival shelters) shelter to sleep under. It was awesome!!! Unfortunately it got really cold out side, so the parents didn’t let us sleep in it. The Palace- There was a spot by the stream and we decided to build there. We gathered 5 or 6 huge logs, probably 12 feet in length each and leaned them against a very large tree. We gathered ones about half the size and leaned them against the larger ones. We also leaned about 100 medium size sticks to keep the leaves from falling out. Once we were done with the frame, we raked leaves and weeds in to a big pile. Then we started throwing the leaves on. It took a long time because of how big the palace frame was. We had people inside with rakes throwing any leaves that fell in back on. The final thing we did was add a little mud, just to keep everything together. When it was done it was Absolutely Awesome!!! 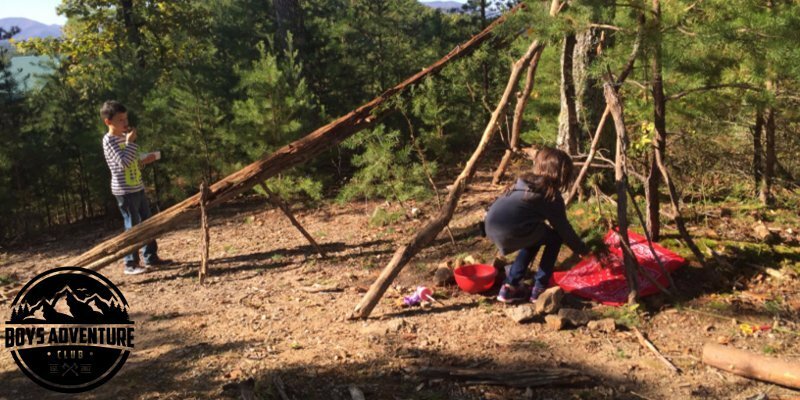 The Rock Shop- The 8 year olds found a large rock, probably 5′ by 5′ and decided to build their shop there. They had: bandanas, moss, logs, and many more random things. It was actually really cool. The Bottle Race Course- Coming soon. Dusters- You can make dusters very easily in about a minute. All you need is a 12 inch stick, a few pine needles, and some string. All you do is tie the pine needles to the stick with the string. Brooms- Brooms are made the exact same way as the dusters, but you use a longer stick. Cloth- In Teribithia Canada we found out that you can actually sew leaves together. It’s really simple, but does take a while. To start you need to find about 50 maple leaves. Basically all you do is overlap 2 leaves and sew them with the leaf’s stem. It’s very simple but does take a while.